Just writing this makes me so stressed because I ask myself everyday, do I like Starbucks coffee more or Dunkin Donuts? First off, what do I even order to make that judgement, right? Well, I am basing this off of pure black coffee y’all. Before I get into which one is ‘better’, lets explain why I even drink black coffee. For many years, I was that person who would say “ew! You drink black coffee?? ?” So I would get my regular cream and sugar with a typical sweet flavor added into it and that got me through the day pretty well. Yeah… it wasn’t long until it started making me really nauseous and uncomfortable. (Lets keep in mind, I am lactose intolerant). So how do I know which chain is the real deal when it comes to black coffee? We can add the fun syrups and flavors later, but lets base this judgement on the actual coffee now. Well for starts, if you are in the mood for just a regular cup of coffee, then it depends on your taste of the companies’ original coffee blend. Starbucks’ coffee tends to be very strong while Dunkin Donuts’ coffee tends to be more watered down. 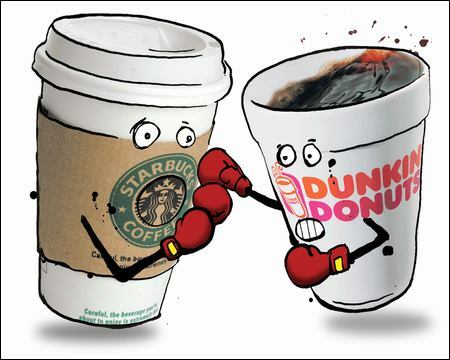 I personally prefer a Dunkin’ Donuts cup of plain coffee compared to Starbucks IF its just for my daily routine. I usually grab a Starbucks if I need something a bit more strong, like for an exam, quiz, or long day. When it comes to the special-flavored drinks, I definitely have to give it to Starbucks. Starbucks offers a wide variety of flavored coffees. I personally love the pumpkin spice and caramel brulee latte. Dunkin’s special flavored drinks aren’t that great to me. Hands down, Dunkin’ Donuts definitely beats Starbucks when it comes to the iced coffee. When I would drink flavored coffee, I survived on caramel iced coffees. Dunkin’ Donuts is cheaper than Starbucks so it wins in this category. Starbucks drinks can be really expensive and sometimes you need to rely on those Starbucks gift cards to get you through these difficult times. So to be honest, I can’t say one is greater than the other. I have apps for both of them. I go to both of them. I spend a lot of money on both of them. I enjoy both of them (at different times). If you need recommendations as to what to get from either one of them, let me know! I definitely have had more than just black coffee!